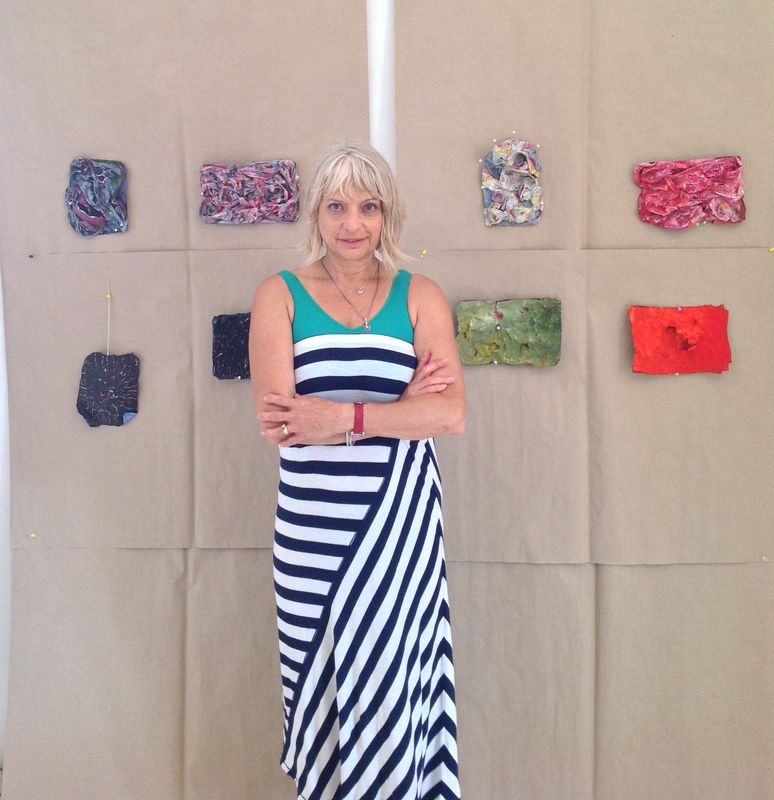 Christine Palamidessi in her Studio. 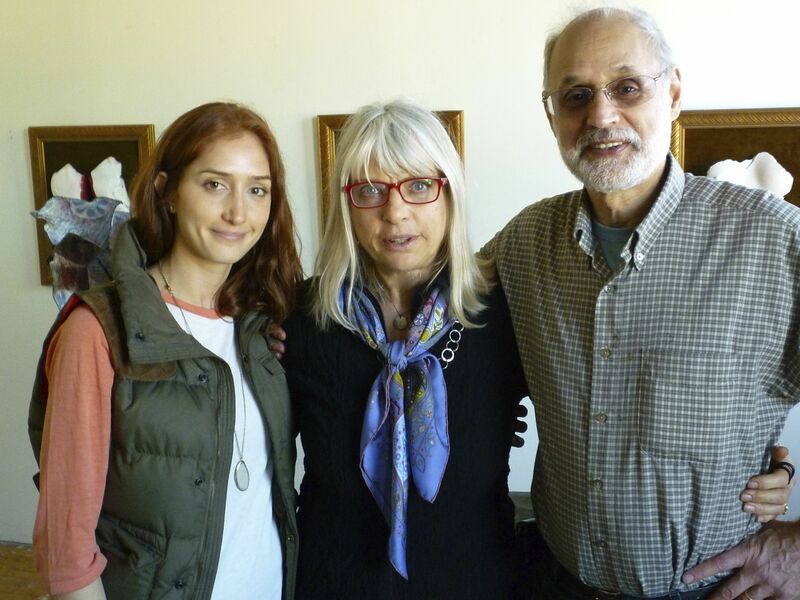 With daughter Ruby Bagedonow and husband Matthew Bagedonow. Christine Palamidessi is an American sculptor and printmaker. She studied mask-making and cartapesta technique in Venice, Rome, and Lecce, Italy. Her body crests and breastplates have been on exhibit in Boston’s State House and galleries in Boston, Washington DC, Woodstock, Vermont, Pittsburgh, and Otranto, Italy. “Grandmothers,” her community awarded-memoir, is engraved on a granite monolith and installed as public art at Jackson Square, on the Orange Line, in Boston. She has degrees in Film and Writing from University of Pittsburgh and a MA in Creative Writing from Boston University. She is author of two novels, has worked as a book and fiction editor, and taught writing and courses in Ethnic Literature at Boston University. She has received numerous awards: Barbara Demming Award for Women Writers, an UrbanArt award for public art, a Dante Alighieri Fellowship, Mass MoCA Artist in residency and was invited visiting artist at American Academy in Rome. Cannonball casts from 1480 Ottoman siege of Italy. The paper casts are the film, or warrior, between visible and invisible worlds. Palamidessi, a devoted yoga practitioner, has been deeply influenced by her practice. Her visual work re-consecrates and re-mythologizes the body and objects surrounding us with art that is a shell and/or surfaces between the visible and invisible worlds. Her imprint-based sculptures capture not only form and the beauty of her subjects but also their atman–or energy. Some the subjects she has investigated/re-consecrated/re-mythologized are Brazilian women, pineapples, Yoga teachers Palamidessi, cannonballs ( from the 1480 Turkish invasion), and the sidewalks outside Harvard University’s Science Center. Christine Palamidessi in Otranto Italy, BAU Institute. “War Chronicles” in background. I taught writing at Boston University for 13 years and at one point–after the entire writing process and business was done on-line via computer and internet–I felt the need to make words and forms on paper. I began making sculptures from paper that were the size of a computer screen. I wrote on the sculptures. The work evolved. Looking back: the essence of my writing was VERY SIMILAR TO WHAT HAPPENS IN MY WORK AS A VISUAL ARTIST! My two novels, The Virgin Knows ( 1995/2008) and The Fiddle Case (2008) are about the sacred energy and magic in art. The Virgin Knows deals with the nose of Michaelangele’s Pieta after it was hammered off the statue by Laslo Toth in 1972; The Fiddle Case follows the adventures and misadventures of two young women as they transport a magical violin cross country. I look at the invisible world and bring it to the forefront. While working full time as a visual artist, I continue with writing: I do interviews and reviews of art (for hire and you can read many of those interviews on www. Palamidessi.blog) With Carol Bonomo Albright I edited a collection of work published by Fordham University Press, American Woman, Italian Style (2010). My writing is is many anthologies, some of which are Our Roots Are Deep with Passion, Don’t Tell Mama and Wild Dreams. In Boston, I worked producing plays with the Nucleo Eclettico Theater, and in 1991 got a MA in Creative Writing at Boston University, where I studied with Leslie Epstein, Sue MIller and Nobel Prize winner Derek Walcott and Poet Laureate Robert Pinsky. I taught writing at BU for13 years. 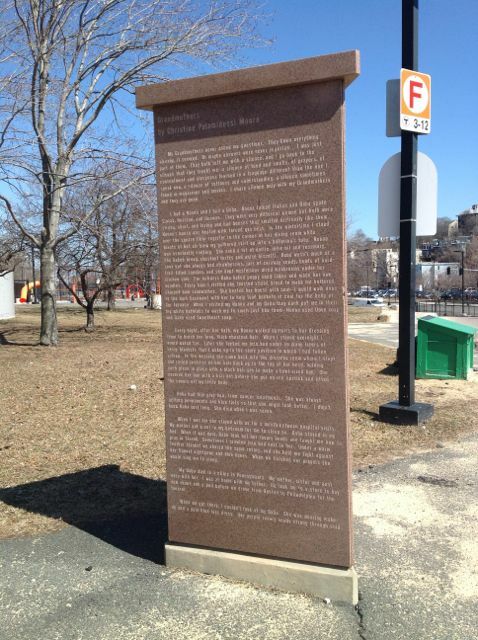 My memoir “Grandmothers” is engraved on a granite monolith installed at Boston’s Jackson Square subway station. Christine Palamidessi. Granite monolith. “Grandmothers”. At MBTA Boston, Jackson Square Station.